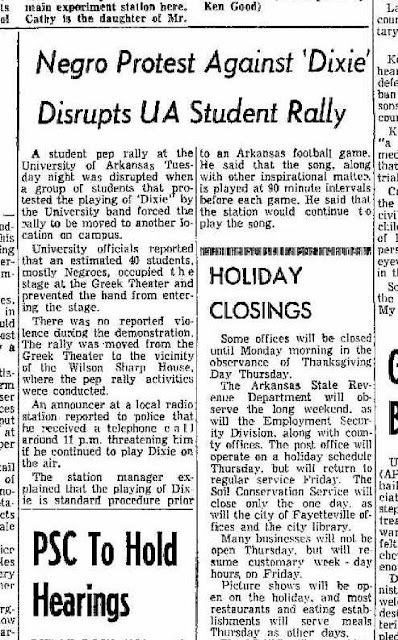 The Student Senate of the University of Arkansas voted on Tuesday, December 2, 1969 for a resolution recommending that the university’s band quit playing Dixie as a fight song at Razorback sporting events. The vote was 27 to 6. I was a member of the Student Senate on the night we drove ole Dixie down. But we didn’t know, really, what we had done. In truth, student senate resolutions -- outside a very narrow range of actions -- rarely affected what the university did and how it did it. The student senate certainly did not make policy for the university, but sometimes we expressed our views, even if we knew that they would likely have no influence. This time, much to our surprise, our resolution, according to Worthington, influenced a high profile university decision. The student senate’s Dixie resolution came at a dicey time. A big football game with the Texas Longhorns was coming, and both teams were undefeated. Some commentators said the game, to be played in Fayetteville, was for the national championship. 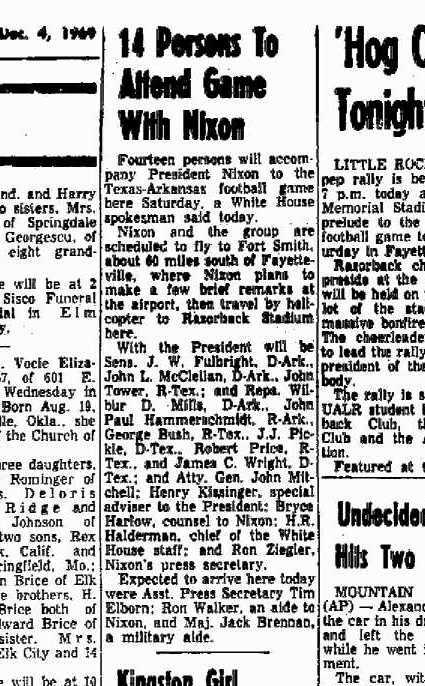 It was scheduled to be televised nationally, and rumors were floating that President Richard Nixon would be attending. The game -- with the local excitement and national prominence -- offered an opportunity for a couple of groups with grievances to have their voices heard. 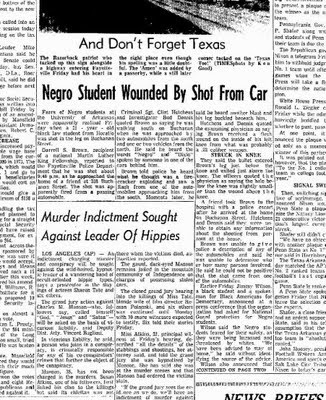 The first was a local group -- mostly African-American students -- who were unhappy with the racial situation at the University of Arkansas. Blacks made up a tiny percentage of the student body, and many felt mistreated individually and as a group. One example, they said, of the mistreatment was the tradition of playing Dixie as a fight song at university football games. The unhappy students, members of Black Americans for Democracy (BAD), wanted the playing of that song, which they considered racist, to be discontinued. Another group was concerned with the Vietnam war. The group included students, faculty members, and locals. One of the main leaders of the anti-Vietnam group was a 1964 graduate of Fayetteville High School and Vietnam veteran, Don Donner. Another was UA physics professor, Art Hobson. The group’s plan for a "pro-peace" protest went into full gear when Nixon announced he would attend the game. With the prominence of the game and guests, UA administrators feared that the protesters would interfere the game and detract from the university’s day of national prominence. The fears were heightened by the disruption of a university pep rally by some members of BAD. Also, some anti-Dixie students vowed to storm the field during the game if Dixie were played. The UA student senate voted for the anti-Dixie resolution in the context of these tensions. It was an unlikely group to take a bold stand against on this issue. Only one student senator was black (Eddie Walker). The previous year George Lease, president of the Student Association, had appointed Gerald Jordan to be the first black student senator. A large proportion of the senators were elected by all-white sorority and fraternities. (As I recall, the senate seats were apportioned by giving each each sorority and fraternity a senate position, giving each university dormitory a seat or two, plus allotting a few seats to be elected by off-campus students.) However, the president of the Student Association supported the resolution and, according to David Davies, one of her advisors, arranged for small group meetings with a couple of BAD members talking to one or two student senators. These meetings were held just before the December 2nd senate meeting. Some people complained that the student senate passed the anti-Dixie resolution because it was intimidated by BAD. I disagree. I believe that the senate members were effectively lobbied by BAD and were persuaded by these small group conversations with BAD members that voting for the resolution was in the best interest of students. In truth, I think that most of us viewed the anti-Dixie resolution as a symbolic action that would express an opinion, but not change anything. Thus, it was seen as a low stakes vote on a resolution that generated intensity among one group of students, but not much interest among most them. I voted for it for three reason. First, I was convinced by the sincerity of and arguments against Dixie by the BAD students. Second, I could understand why the descendants of slaves viewed the song as, at best, insensitive, and, at worst, given the context of a football team that still had an all-white team on the field, as racist. Third, I never much liked Dixie nor understood what it had to do with the University of Arkansas. It certainly had no relevance for me with roots in the Ozark mountains. As the game approached, a strange shooting occurred on Friday night before the game, raising the concern of some black students for their safety. Darryl Brown -- who had been a football team walk-on in 1964 -- was shot in the leg below the knee on a street at the edge of campus. He had little information he could provide police about the shooting. A spokesperson for BAD asked that the National Guard be sent to campus to protect black students. Despite the unexplained shooting incident (which attracted little newspaper attention), the game took place without major incident and had a memorable finish. The anti-Vietnam group conducted a peaceful vigil at a location, a hill overlooking the stadium, specified by the university. Dixie was not played. Anti-Dixie students did not interrupt the game. President Richard Nixon, Henry Kissinger, Governor Winthrop Rockefeller, Congressmen George Bush and John Paul Hammerschmidt, Arkansas Senators Fulbright and McClelland and many other dignitaries watched an exciting game won in the final minutes on a daring fourth down pass by the Texas team. The game inspired a book, Horns, Hogs and Nixon Coming: Texas vs. Arkansas in Dixie’s Last Stand by Terry Frei. He called the game “Dixie’s last stand” because it was the last game played by all-white major football teams. Also, a documentary, 1969 The Game of the Century, Texas Longhorns, was released in 2010. Another documentary, The Big Shootout, is now being finalized (see http://bigshootout.com/the-big-shootout/ ). After a series of student-senate votes, a campus-wide referendum, and numerous confrontations of which a few turned violent, Dr. Worthington discontinued the band’s planning the song just prior to the Texas-Arkansas Great Shootout of 1969. In fact, a student referendum was held in the spring on whether the UA band should play Dixie. Students voted overwhelmingly (2010 for and 944 against) to resume playing Dixie. The real explanation of what happened in December 1962 is likely that Worthington (with the assent of the UA leaders) used the student senate resolution to justify an action had he had wanted to take for some time: quit playing Dixie. The student senate resolution provide good cover for him to act, and likely, his action defused the potential for disruption of the biggest football game in Arkansas’ history and was an important step in making minority students feel welcome at the University of Arkansas. After the pro-Dixie resolution passed, Worthington and his successors refused to start playing Dixie again. Good post, Dan. This fills in a lot of gaps for me since I had been out of the country for two years previous to this, only to arrive back home just before that game in '69. When I started school in '65 with the rest of our class, I always thought that the fight song we still hear today was one of the better ones in the country and I actually don't remember Dixie being played as a fight song except after a game-changing play. Like you, I can't even think of why it would be connected to the UofA anyway. But like a lot of things back then, it was just the "way it was", without much thought. Good decision that was to end it. Forgot to mention, I remember meeting Darryl Brown in the fall of '65 during registration. I think it was the same Darryl Brown from this newspaper article. I didn't know he was shot later. I guess you could say I didn't know much at all back then. On so many levels. Thanks, Gil. I sure you had more important things on your mind in the two years before you returned to UA in 1969. 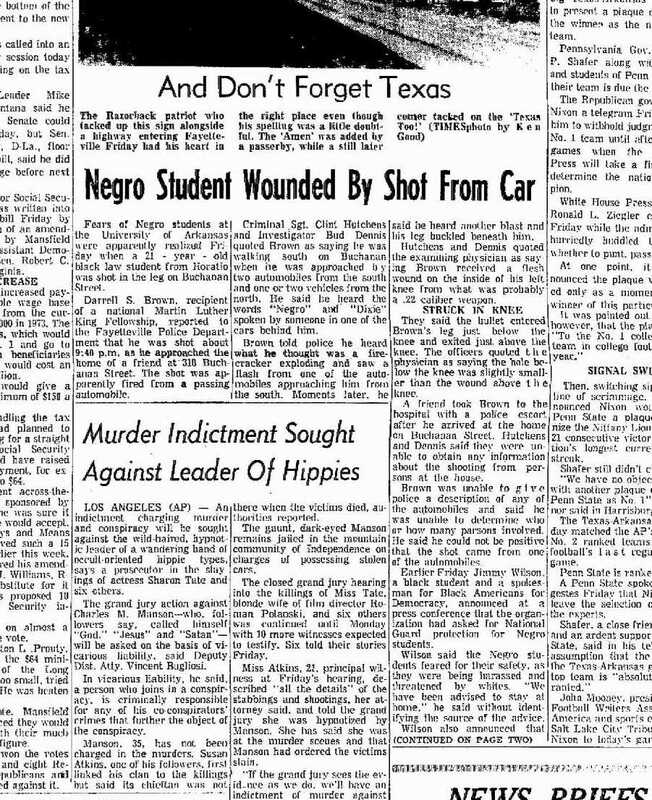 The Darryl Brown shooting got only one story in the NW Ark. Times and little coverage elsewhere. I am sure the D. B. you met in '65 is the same person. The biography of Nolan Richardson, Forty Minutes of Hell by Russ Bradburd has a chapter (14) on Darryl Brown's 1965 "walk on" freshman year on UA football team and how he was treated. It does not mention him being shot. Brown went to UA Law School and was a lawyer for decades in Little Rock. Story update: A conversation with David Davies, who was SGA President Jo Martin's chief of staff in 1969, reminded me that she did strongly support the resolution. In fact, she organized the meetings between the student senators and representatives of Black Americans for Democracy. These small group meetings (each with a couple of BAD representatives and a couple of student senators) took place just before the Student Senate convened for its regular meeting. At that meeting, the anti-Dixie resolution was passed. Also, according to David, the student senate resolution was followed later by a student referendum on the resolution. A majority of students voted against the resolution, that is, against recommending that the UA band quit playing Dixie. The head of the UA band, Dr. Worthington, did not act on the vote. First of all, among the students the University's first year (1871) was the university's first African American student, James McGahee, who came from Woodruff County. There were always black Americans (who supported democracy) at the U. of A.!! As to playing "Dixie," the university band attended Confederate soldier's reunions in Little Rock in the late 1910's and 20's, and the old men asked the band to play "Dixie" for them. That's when it started. African-American students didn't object to "Dixie" publicly until the 60's. All of us in band were fiercely loyal to "Doc" Worthington and supported his role in stopping the playing of a traditional song that offended a small minority of students. Some of us just didn't like the way the song was eliminated. Since this is still a flash-fire topic that instills anger in readers, I'd better stay anonymous. Thanks for your comments. It is always useful to hear how different people viewed the decision to quit playing Dixie in 1969. I obviously, as stated in the blog entry, had a much different opinion than you, and the overwhelming majority (2010 supporting playing Dixie and 944 opposing) of students who voted in the referendum. As for the reasons for the decision, since Worthington (likely in consultation with Mullins and others in the administration) made it, he knows better than anyone. I personally doubt it had anything to do with a misunderstanding of when the band started playing Dixie (I certainly never heard that given as a reason) and more to do with the threats to the "Game of the Century," an understanding that the sports teams were integrating and continuing playing the song was untenable, and their own personal views about the propriety of continuing to play a song that had become a strong negative symbol to a significant number of students on campus (and it was not only black students and BAD with that view). Also, the whole Civil Rights movement in the preceding ten years could not be ignored. Best I can tell, students did not vote on which music the band would play, so I was not sure why they would be asked to vote on Dixie and not all of the other songs in the band's repertoire. I guess if we define democracy as the right to vote on such things as the band's music and the theater's plays, the university was sadly lacking. You darn right the Vietnam Moratorium Resolution passed. I introduced it. 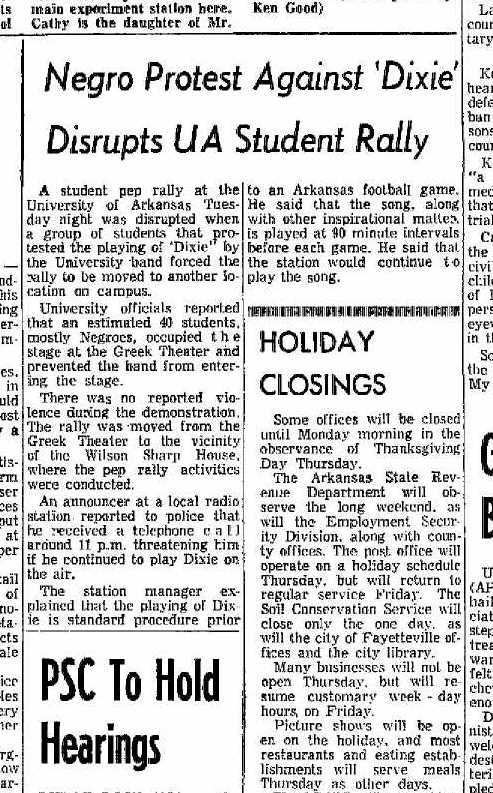 I have a clipping from the Arkansas Traveler about Moratorium activities at the University of Arkansas. It says you were the emcee of a rally held outside of Walker Library beginning at 11:30 a.m. on Oct. 15th. The march starting at 4:00 p.m. to the downtown was coordinated by my old junior high school/high school classmate Hal Brown. This was such a great post. Thank you for writing this. I enjoyed reading it! Correction to a comment made above: The first black admit to the UA was Silas H. Hunt in 1948. No other black students were allowed to attend the university before then. I am a UA alum and was a member of the Razorback Marching Band as a majorette (2009-2012). Go Hogs!